BEST VIEW IN TOWN - PRIVATE BUNGALOWS WITH SEA VIEW - KITCHEN FACILITIES - WIFI - PANORAMIC TERRACE - With the Kon Tiki we realised our dreams and we want to share this dream with our guests. The owners of the place Patricia ( Peru) and Juerg (Switzerland) welcome you to tranquility and relaxation. 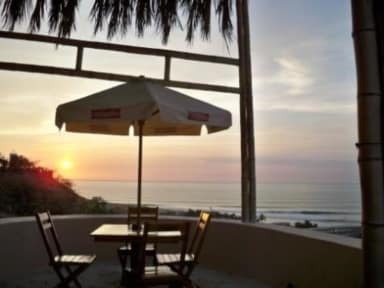 Here you can take a rest from your travelling, sit back and enjoy a unforgettable stay in our little paradise were the pacific ocean, agreeable climate and the wonderful beaches of the peruvian north coast will take you to an extraordinary experience. We offer accommodation in Bungalows all with an amazing view of the pacific ocean and rooms with shared bathroom and garden view. Our Bungalows are for max. 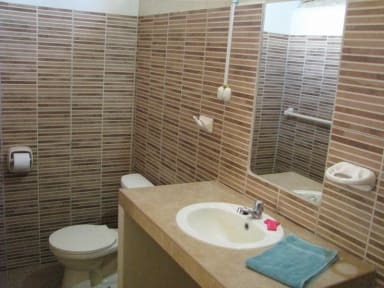 4 persons with private bathroom, mezzanine and terrace. In our Cafeteria we serve breakfast, snacks and drinks.